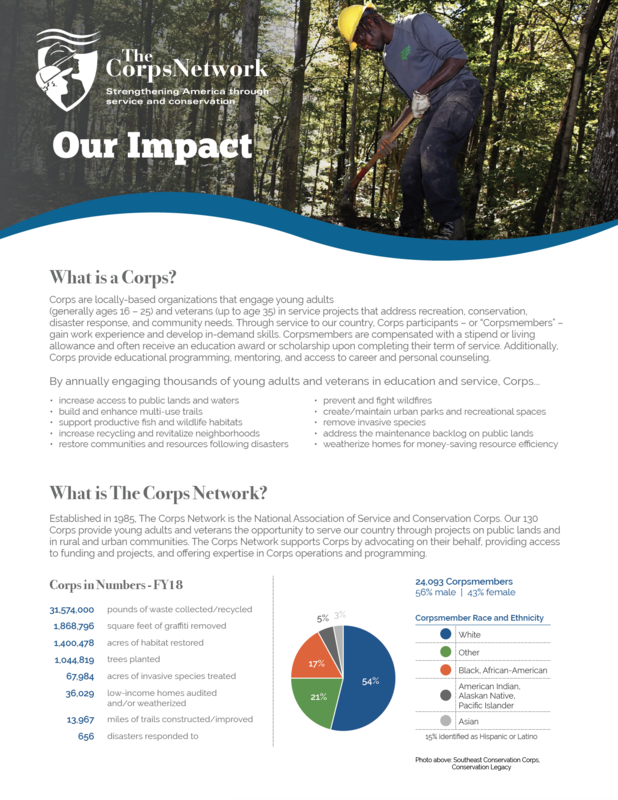 As a Member Benefit, Member organizations of The Corps Network have the opportunity to post open positions on The Corps Network’s Jobs at Corps page. Partner organizations of The Corps Network also have the opportunity to post “featured partner” positions. Scroll below to learn more. General inquires about the Jobs at Corps page can be directed to Grettie vonVorys-Norton (gvonvorys-norton@corpsnetwork.org) and Hannah Traverse (htraverse@corpsnetwork.org). Click here for instructions on how to create a Member Account. “Member Login” in top right corner of the site. You can also go to www.corpsnetwork.org/login. Follow the MM/DD/YYYY format for date fields. Use the “Town, city, park, etc.” field to give specific locations (e.g. Rocky Mountain National Park; Flagstaff; Larimer County). In the State/Territory field, you can select multiple states, or select “National” if appropriate. Don’t forget to include a link to where applicants can learn more or apply (gray box under Benefits). Please include your Corps’ logo. If you include links in the following fields — Organization/Program description, Position description, Job Duties, Requirements, Benefits, Contact information, or Additional information — make sure you use the hyperlink tool in the editor panel. Links that are just copy and pasted will not be clickable. When you hit submit, staff at The Corps Network will receive a notification. Once your position submission has been approved, you will receive an email notification. At that point, your position will be live on The Corps Network’s website. At this time, the site does not offer the option for Members to edit position descriptions. If you have changes you need to make, please contact Grettie vonVorys-Norton and/or Hannah Traverse. We will make changes as soon as we can. In the near future, we hope to offer the option for Members to edit positions. On a regular basis, we will scan posts and remove any positions where the Deadline to Apply and/or Start Date have passed. If you need your Deadline/Start Date edited, or otherwise need the position to remain up past either of these dates, please contact Grettie vonVorys-Norton and/or Hannah Traverse. During their term of service, Corpsmembers gain hands-on job experience, earn certifications, and develop essential 21st Century workforce skills in leadership, communication, and adaptability. If your organization would like to advertise positions to Corps alumni, please contact us to discuss opportunities. The Corps Network posts select positions in the Featured Partners section of our Jobs at Corps page.